In December 2004, three decades later, Carson Cooper, from Buffett’s Radio Margaritaville, located “Penny” with help from Airport Journals, and requested she come on the air. Excited to talk about “Sky King,” the television series that affected so many lives, Winters was happy to oblige. Kirby Grant, a real-life pilot, played Schuyler “Sky” King. The wealthy gentleman rancher helped the sheriff of Grover, Ariz., catch bad guys by tracking them down in his airplane, “Songbird.” Early in the series, “Songbird” was a Cessna T-50. Later, it was a twin-engine Cessna 310B. Sky King’s beautiful teenaged niece, Penny, lived with him at the Flying Crown Ranch, and often helped Sky and the sheriff in their efforts. It was also common for her uncle to come to Penny’s rescue, since on various occasions she found herself in the hands of bad guys. “I had a wonderful time,” she said. Winters also did a Pete Smith movie. In 1949, she was cast in “The Life of Riley.” Jackie Gleason played Chester A. Riley, an aircraft plant employee, in the first 26 episodes (1949-50) of the TV series. Winters was cast as Chester Riley’s daughter, Babs. The part prompted her mother to make a big decision. “The Life of Riley” won an Emmy in 1950 for “best film made for and viewed on television,” beating “The Lone Ranger” and “Your Show Time.” When Bendix replaced Gleason, some cast members stayed on, such as Rosemary DeCamp, who played Chester Riley’s wife, Peg. Others departed, including Winters. Besides being cast in films including “Gambling House,” starring Bendix and Victor Mature, in the early 1950s, Winters also won the part of Penny in “Sky King.” Still today, it’s hard for fans not to think of her as Penny. Many of those letters have been from pilots who say that “Sky King” inspired them to learn to fly. Winters recalled a pleasant surprise she had on a memorable commercial flight. Winters said that being the only woman on the set had certain consequences. 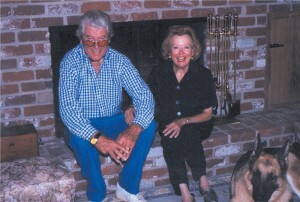 Gloria Winters relaxes in front of the fireplace with her husband, Dean Vernon, and her German shepherd, “Happy.” Vernon passed away in 2001. The petite actress laughingly recalled other struggles, like having to constantly climb into the saddles of horses that were always too tall. “They’d always give me the tallest horse in the world,” she laughed. Winters revealed that although Grant was a pilot, the actors never really went up in the aircraft. She recalled famed stunt pilot Paul Mantz served as aerial advisor on the series and piloted “Songbird” on early shows. Winters and Grant, who was also a song-and-dance person, spent a lot of time together in the off-season as well. They traveled the state fair circuit around the country as headliners, performing as a team. Winters has an especially wonderful memory of the Texas State Fair. “We were signing autographs,” she remembered. “The line went around the arena. Along came Gus Grissom, Pete Conrad, Alan Shepard and Wally Schirra, with their children. They were the heroes of that time, and they were standing in line, behind all these children. They could have broken rank. The last episode of “Sky King” was filmed in 1962. Following that, Grant toured with the Carson and Barnes Circus until 1970, as a featured performer. Grant died in 1985 in an automobile accident while on his way to watch a launch of the Space Shuttle Challenger at Cape Canaveral. He was to be honored by the shuttle astronauts for his achievements in encouraging aviation and space flight. Over the years, Winters has also remained friends with Ron Hagerthy, who played Clipper King in the first few years of the series. After “Sky King” wrapped up, Winters retired from show business. The fan mail she received throughout the years wasn’t the only constant reminder of her years on the series. Beyond offering her adventure, the series also provided romance. Her relationship with Dean Vernon, a sound engineer on the series, turned into a marriage that lasted for more than four decades. Vernon initially thought he wanted to be a rancher. While attending Cal Poly, Vernon, who was a pilot, did crop-dusting to make extra money. He also earned extra money as a rodeo cowboy, and later, a rodeo clown. Although he wanted to be a rancher, he eventually decided it “wasn’t in the cards.” After leaving Cal Poly, he entered the motion picture business. Dean sold his plane shortly before he and Winters got together. But she heard plenty of stories about the plane he rebuilt for himself. For years, the couple lived in the San Fernando Valley. When Vernon retired, they decided to move. Close to a decade ago, after a little research, they moved to their own Camelot–Vista, Calif., in San Diego County. Vernon died Aug. 3, 2001, at the age of 75. The couple never had children, but that doesn’t mean they were alone. “Happy,” a fun-loving German shepherd, has been a fixture in the Vista home for the better part of a decade. Winters continues to enjoy her life in Vista. As an actress cast in various westerns, Winters received several honors within the genre. She received the Golden Boot Award in 2002 and her likeness is on display at the Autry Museum. “They have models of western stars in this big glass case, wearing the clothes that were worn on the shows,” she said. Although she doesn’t like to leave “Happy” alone, Winters does often consent to speaking engagements. 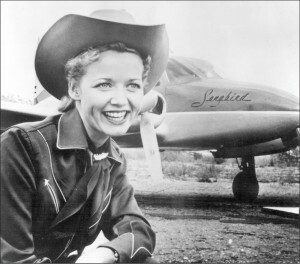 Based on a popular radio program, “Sky King” first aired on NBC in 1951, and then moved to ABC in 1952. Schuyler “Sky” King, a formal WWII Naval aviator, lived on the Flying Crown Ranch in Arizona, with his niece, Penny, and in the earlier shows, his nephew, Clipper. The three of them always had an exciting time, saving the good and foiling the bad guys. Somehow Sky King’s plane, “Songbird”–a twin-engine Cessna T-50 in earlier episodes and a Cessna 310B in later shows–was always involved, watching what was going on from above or getting somewhere just in the nick of time. Kirby’s flying career began in a 1929 Waco. During the early 1940s war effort, Grant made repeated attempts to serve his country as an aviator, but his color blindness destroyed those hopes. Upon his military release, he was placed under contract to Universal Studios. Grant started his career under the name of Robert Stanton, and made more than 50 pictures between Universal, Columbia and Allied Artists. When casting began for “Sky King,” Grant’s agent approached Kirby with the part and set up a screen test. Grant was notified that he had been selected several weeks later. Seventy-two episodes were filmed. The episodes were filled with excitement and danger. The fantastic flying sequences made the series a hit. Grant and his wife, Carolyn, had three children. Grant was killed in a car accident on Oct. 30, 1985, while on his way to watch a launch of the Space Shuttle Challenger at Cape Canaveral. He was to be honored by the shuttle astronauts for his achievements in encouraging aviation and space flight. Although Kirby Grant is gone, the real “Sky King” lives on. As he and other cast members touched the lives of those who watched the show, so will those they encouraged to become pilots touch the lives of those around them. To revisit “Sky King,” a boxed set of all 72 episodes is available on DVD at [http://www.skyking.com], or you can acquire individual volumes of four episodes or the entire collection on VHS at www.SkyKing.com.